Apple has been proudly promoting the super-thin new MacBook that it first unveiled in March 2015 and updated earlier this year. But what about the higher end of its laptop line? The new MacBook is certainly a looker but it doesn't have the power that serious users need for intensive tasks. Thankfully it has sent out invites to an event this Thursday (27 October) at which we will see new Macs debut. And what's more, a pretty-comprehensive leak means we now know pretty much what the new MacBook Pro with Magic Toolbar will look like. The MacBook Pro appears to be getting speakers in the edges at either end of the keyboard - probably depending on what screen size you go for. The OLED touch bar with fingerprint reader replaces the function keys appears to be coming under the name Magic Toolbar. This seems to be able to change to suit what the user needs, be it function touch-buttons, loading status bars and Touch ID. Also visible is a redesigned hinge suggesting this new model will be thinner than previous MacBook Pros. The main leaked photo shows a finger being held on the OLED panel to activate Touch ID, suggesting it will be used for secure payments online just as it can be on the iPhone. Presumably the Magic Toolbar could also be used to lock and unlock the device. Why has it taken so long for a MacBook Pro update? Defining generations of MacBook Pros isn't quite as easy as it is with iPhones or iPads, because the internals are often upgraded separately from the external design, and Apple doesn't really stick to a recognisable release schedule. It quite often pushes out small upgrades for its laptops without much fanfare or any special press events. Both the 13-inch and 15-inch MacBook Pros were last upgraded back in 2015 with faster storage, better graphics and Force Touch trackpads (built to respond to taps of different pressures). The dates were March 2015 for the 13-inch model and May 2015 for the 15-inch). The smaller model got a processor upgrade too. So when we talk about "new MacBook Pros" we're referring to both minor and major upgrades for the machines - a major update involves some kind of design refresh as well as better internal components (along the lines of the Retina display upgrade we saw in 2012). Since Apple has started updating the 13-inch and 15-inch models separately the issue becomes even more confused. There was talk we would see new machines at Apple's March event but we got a new iPhone and a new iPad instead. Again in September, the rumours came to nothing.. It's fair to assume Apple is using the new-look MacBook as a testing ground for the MacBook Pro, so some of the technology and design inspiration may well filter through to the more powerful laptop in the near future. The imminent arrival of USB Type-C on the MacBook Pro is pretty much a given considering how enthusiastically Apple has been promoting its inclusion on the new MacBook. The SD card slot might disappear, sadly, but there will be a new 2TB storage option, we're hearing. Rumours point to the same display panel resolution. Educated guessers might well point to that Retina display resolution, which hasn't shifted since 2012 - perhaps Apple will use some of the know-how it's picked up from building the 5k iMac to boost the resolution of the MacBook Pros in the next refresh. In May, sources suggested the new Macbook Pro would have a noticeably thinner and lighter design that previous versions and will include Touch ID support and a new OLED touch bar display located just above the keyboard. Rumours point towards this being powered by a similar processor to that used in the Apple Watch and Apple Watch Series 2. Analyst KGI Securities also claims that the MacBook Pro updates are the, “brightest spot for Apple's 2016 rollouts,” and will come to a planned 13-inch model and a 15-inch model which are both due sometime during the fourth quarter of this year. 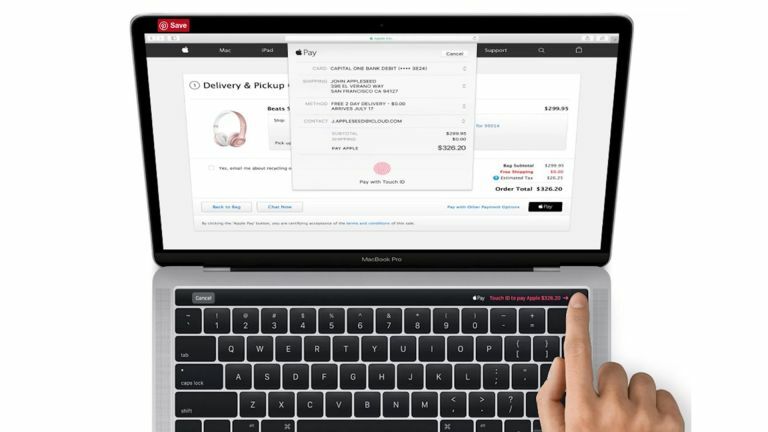 The physical function keys currently found above the keyboard could be replaced by the aforementioned OLED touch bar, with said new MacBooks also supporting USB-C and Thunderbolt 3 at launch. There's also talk of a special new metal injection molded hinges being used as well. Apple's is also rumoured to be adding a new Macbook model alongside the upgraded 13-inch and 15-inch models. The idea is to introduce a version that takes cues from the 12-inch Retina model - sources suggest this is going to be presented as a entry level model to entice new adopters to go Mac. That Apple wants to keep improving its MacBook Pro line is a given, so there's no doubt that new MacBook Pros are on the way—the only questions are when they'll appear and what they'll look like when they get here. The two refreshes we've seen in 2015 mean Apple must have something planned for 2016 or it's going to fall way behind. Apple has already missed out on the Christmas shopping season and we think a refresh is likely to be imminent - in that it could happen any day. Apple wouldn't necessarily need a media event either, and could just update its online store. Leaks suggest that Apple will not refresh the 11-inch MacBook Air but will instead release a new 13-inch MacBook Air with multiple USB-C ports.